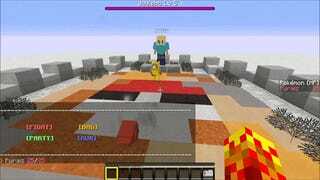 With all the necessary elements and that familiar layout included, PhoenixSC’s work is probably the best attempt yet to recreate Pokémon’s battle system in a completely different environment like Minecraft. Pokémon Cobalt & Amethyst is an adventure map currently being developed by Phoenix Projects, involving the recreation of a new generation of Pokémon in Vanilla Minecraft. Yes, this is a full-fledged map. In case you’re curious, it will implement most, if not, all of Pokémon’s features in its own unique fashion, including and not limited to Pokémon, attack moves, stats, animations, cutscenes and enemy encounters. That’s right! A completely new generation of Pokémon awaits! You can follow the project’s progression here and on the Minecraft Forums.